Fitness equipment is more than equipment – it’s the vehicle that takes you from the person you are to the person you wish to become. The Linex line of fitness equipment delivers the performance, durability and ergonomics that make it possible. This rugged, high-performance line has everything you need, whether you are working out once a week, once month or training daily. Linex by TKO line of products deliver the highest level of performance. Their features include: sturdy powder coated steel frames, large easy - to - read display consoles, gel padded seats, transport wheels, floor height adjustment and ergonomic movements on all our elliptical trainers. All Linex by TKO products are certified with iso 9001 standards for design development and production. Buccaneers RB Carnell 'Cadillac' Williams earned three Diet Pepsi NFL Rookie of the Week awards. DETROIT (Feb. 2006) -- Tampa Bay Buccaneers running back CARNELL “CADILLAC” WILLIAMS was named the 2005 DIET PEPSI NFL ROOKIE OF THE YEAR, Pepsi and the National Football League announced today. More than 385,900 fans voted for the five finalists on NFL.com from January 6 through January 30 to determine which rookie would win the 2005 DIET PEPSI NFL ROOKIE OF THE YEAR award. Pittsburgh Steelers quarterback BEN ROETHLISBERGER was named the 2004 Pepsi NFL Rookie of the Year. Houston Texans running back DOMANICK DAVIS won the award in 2003, while New York Giants tight end JEREMY SHOCKEY won the inaugural award in 2002. During the regular season and playoffs, more than one million fans voted for the Diet Pepsi NFL Rookie of the Week and Rookie of the Year. NFL vice president of player and employee development Mike Haynes presented Williams with the award during a press conference in Detroit, the site of Super Bowl XL. Williams set a Buccaneers single-season record with six 100-yard rushing games in 2005, including three to start the season. He finished with 1,178 yards and six touchdowns on 290 carries. Williams rushed for 148, 128 and 158 yards respectively in Weeks 1-3, announcing his arrival on the NFL scene. He provided the Buccaneers with several strong performances late in the season as the team made its playoff run, including a 112-yard, two-touchdown effort in a Week 14 victory over the NFC South-rival Carolina Panthers and a 150-yard, one-touchdown game in a Week 16 victory over the NFC South-rival Atlanta Falcons. Williams, who attended Auburn University, was nominated for seven Diet Pepsi NFL Rookie of the Week awards, winning three. The five finalists were chosen after tabulating this season’s fan voting. Each week, five nominees were chosen and NFL fans voted for the winner on NFL.com. Fans could vote for one of these five players on NFL.com or SuperBowl.com from January 6 through January 30 to determine the 2005 DIET PEPSI NFL ROOKIE OF THE YEAR. In addition, for the first time, NFL fans could cast their vote for the 2005 DIET PEPSI NFL ROOKIE OF THE YEAR using Sprint wireless service - an opportunity available only to Sprint customers. This fast, convenient voting method involved texting the word PEPSI to short code 51933. Sprint customers then received an interactive text message ballot that listed the five finalists. The winner will be presented the 2005 DIET PEPSI NFL ROOKIE OF THE YEAR award during a press conference in Detroit, the site of Super Bowl XL, on Thursday, February 2, 2006. The five finalists were selected for their outstanding performances throughout the 2005 NFL season. Each week, five nominees were chosen for Diet Pepsi NFL Rookie of the Week and NFL fans voted for the winner on NFL.com. Those results were used to help determine the finalists. This is Pepsi’s fourth year as the official soft drink sponsor of the NFL and the first year that Diet Pepsi will present the NFL Rookie of the Year award. Voting is now closed. Please check back on Thursday, February 2 at 4 p.m. ET for the announcement of the Diet Pepsi NFL Rookie of the Year. Finished the season ranked first among NFL rookies, and 15th overall, with 10 sacks. He made an immediate impact on the Chargers’ defense, recording 57 tackles, the fifth-highest total on the team. Some of Merriman’s best performances came in San Diego’s biggest games. In a Week 8 victory over the AFC West-rival Kansas City Chiefs, he recorded five tackles and two sacks. Then, when the Chargers knocked off the previously-undefeated Indianapolis Colts in Week 15, he recorded seven tackles and two sacks. Merriman, who attended the University of Maryland, was nominated for four Diet Pepsi NFL Rookie of the Week awards, winning once. Led the Seahawks defense with 104 total tackles, to go along with his four sacks, three interceptions and one fumble recovery. In a Week 10 victory over the NFC West-rival St. Louis Rams, Tatupu recorded 10 tackles and one sack. He had a 13-tackle performance in a win over the New York Giants in Week 12 and scored his first career touchdown on a 38-yard interception return the following week in a victory over the Philadelphia Eagles. Tatupu, who attended the University of Southern California was nominated for four Diet Pepsi NFL Rookie of the Week awards this season. Led the Bengals in tackles with 98 and led all rookies with five interceptions this season. The middle linebacker got off to a fast start in 2005, recording seven tackles and one interception in his NFL debut, a Week 1 Bengals victory over the AFC North-rival Cleveland Browns. Thurman, scored his first career NFL touchdown on a 30-yard interception return in a Week 6 victory over the Tennessee Titans. In a Week 13 victory over the rival Pittsburgh Steelers that helped the Bengals clinch the AFC North title, Thurman recorded nine tackles, one interception and one forced fumble. Thurman, who attended the University of Georgia, was nominated for three Diet Pepsi NFL Rookie of the Week awards this season, winning one. Ranked second among NFL rookies with eight sacks this season. His 58 tackles in 2005 were fifth-most on the Cowboys’ defense. Ware recorded a sack in four consecutive games from Week 3 to Week 6, with the Cowboys winning three of the four contests. He also finished the season strong, registering nine tackles, three sacks and three forced fumbles in a Week 16 victory over the Carolina Panthers. Ware, who attended Troy University, was nominated for three Diet Pepsi NFL Rookie of the Week awards, winning one. Set a Buccaneers record with six 100-yard rushing games this season, including three to start the season. He finished with 1,178 yards and six touchdowns on 290 carries. Williams rushed for 148, 128 and 158 yards respectively in Weeks 1-3, announcing his arrival on the NFL scene. He provided the Buccaneers with several strong performances down the stretch of the season as well, including a 112-yard, two-touchdown effort in a Week 14 victory over the NFC South-rival Carolina Panthers and a 150-yard, one-touchdown game in a Week 16 victory over the NFC South-rival Atlanta Falcons. Williams, who attended Auburn University, was nominated for seven Diet Pepsi NFL Rookie of the Week awards, winning three. 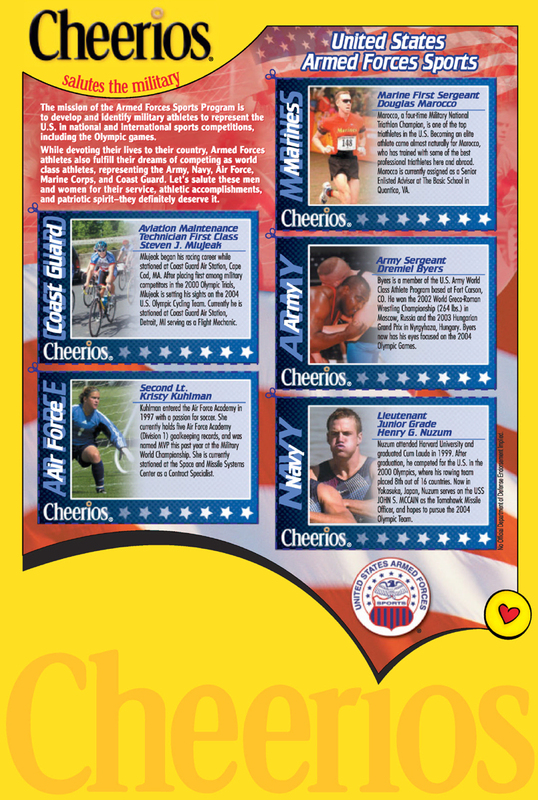 FORT LEE, Va. – Military athletes will soon make “cereal history.” The Armed Forces Sports Office has teamed with corporate partner General Mills to honor five armed forces athletes on a commemorative Cheerios box. Army, Marine Corps, Navy, Air Force and Coast Guard athletes are featured on the boxes, which include action shots and short biographies of the athletes outlining their accomplishments as both military members and armed forces athletes. The following workout is a start. After trying it for a while (4-6 weeks), evaluate where you're at, your results, and adjust accordingly. Updates on game scores, stats, team match up and sports news. Official NBA Web Site. Provides Stats, Career Highlights and team links. Tour info, events, product reviews and techniques. Contains rules, judging criteria, bodybuilding events. Also includes fitness magazine, with articles and forums. Covers the boxing scene, title fights, and club shows, with photos, boxing ratings and records. Covers intense sports and venues from around the World. Athlete interviews and highlights. Improve tracking and shooting skills. Obtain latest hunting news. Golf event scoring and includes all PGA's events. Latest running news, calendar of events and race results. Want to improve your game, connect with others in the golfing community, your one-click guide. Locating hunting and fishing guides and products. Provides tips on outdoor adventures. Provides rates, packages, and opportunities for the avid athlete.